What are your two favorite things to find inside a mason jar? If your answer is "pickles ... or maybe moonshine," then I've got some good news for you. 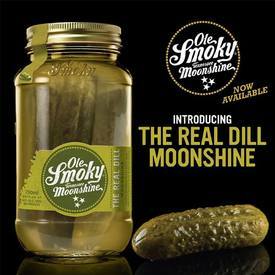 Ole Smoky Distillery, a Tennessee company with absolutely no fear of using the wildest corners of their imagination, is now selling a The Real Dill Moonshine that has dill pickles just floating on the inside. The Real Dill has crisp, salty pickles soaking in a delicious jar of proofed up moonshine. Enjoy it with a Bloody Mary, as part of an afternoon snack, or straight up - the choice is yours.